This versatile tube fly and bubble head were developed based on big game lures. You can make various combinations; single or double streamer, add the bubble head and you have a single or double length popper. The head is reversible, bullet shape forward or flat surface forward for additional bubble and pop. Use single-hook or double-hook rig on these tubes. The hook may be allowed to swing free or, if a set hook is preferred, the hook can be pushed into the soft tubing at any angle. Tandem rigged flies are 2 parts. Essentially 2 Big Game tube flies, one fly slid into the other, with hooks trailing the back fly in tandem, with popper head attached to the front fly. This creates a large fly in the 9 inch range with a large silhouette. This is a single Big Game tube fly with popper head and hooks trailing the fly in tandem. 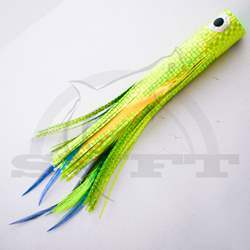 This creates a fly in the 6-7 inch range and works for billfish that do not require a large bait. Front & back tube with popper head. I developed this fly in working with Nick Smith who is a renowned international billfish angler. Nick, to date, has caught thousands of billfish on a fly and has released over 100 Blue Marlin on fly. “Because of the search and destroy attack” of Blue Marlin, he needs to find the fly quickly. Otherwise, he is off on another search. This fly is very visible in silhouette. It makes noise, and causes turbulence. IT GETS THE MARLINS ATTENTION! The fly itself is tied on a 2-3/4 inch x 1/4 inch tube. The fly is 10-1/2” to over 12”. A popper disk is attached to each fly. Color is pink squid and heads are white. This fly has dual sets of hackles to add to the silhouette and is tied in the round (not vertical, as many flies). It has flash on the sides and 15mm doll eyes epoxied on. We have based this pattern on continued refinement during over 300 Blue Marlin raised, this year alone, by Nick and his crew. Due to the design and construction, it will provide more bites and more hook ups per bite. These are hand tied here in the US. Please allow some time when ordering, as they may need to be tied to order. 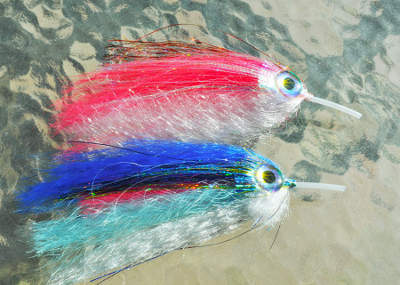 If rigged, all flies are rigged to order with a standard 20lb bimini attached to 130 Lb shock. On this fly, 2 - 8/O Gamakatsu hooks are snelled in tandem. If you would like them “Phillips Rigged“ please indicate this when ordering. As with all of our flies, you may order different class bimini’s, if chasing records or challenging yourself. Please also allow some time for this option. With the success of our Big Game Tube flies, we had requests for same patterns in smaller versions. So we created a series of 4” and 5” flies for midrange and inshore species. These flies are sold as a single tube with a popper head on the tube. 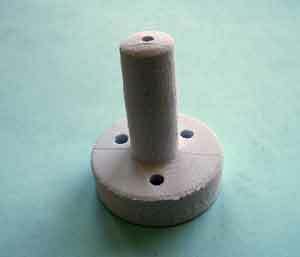 We have also used these for freshwater fish with success. They can be fished with or without the popper. 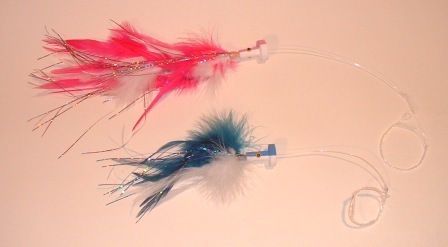 These are EVA tube popper with a witchcraft holographic tape exterior and under tie of hackles . A 1/8 inch OD tube protrudes though the head and extends with a soft 1/8 inch ID tube, to seat hook into. 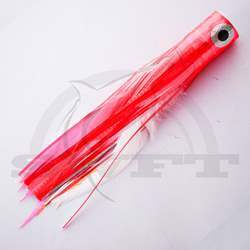 The standard sizes are in 3/4 inch and 1 inch diameter, 10 inches long, and in a myriad of colors. As with all rigged flies, we rig to order, so please allow for some time to ship. 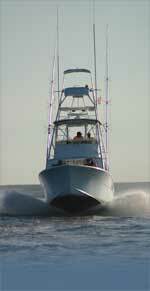 Standard rigging is with 20lb class bimini’s attached to 100lb shock, and 2 - 6/0 Gamakatsu hooks. Developed by Pat Dunlap at Cascade crest. 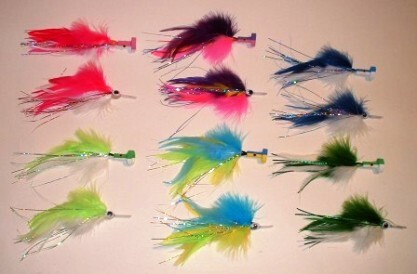 These are tied with synthetic Yak hair and are tube flies. Great subsurface fly for pelagic species, or can be used with a popper on top. Please note: these are heavy in material and may cause entrapment on a billfish. Fly is 5-1/2 inches long with a 1 inch tube nose that can be used if with a popper. 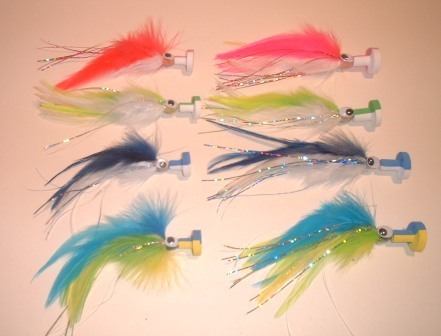 Contains a full selection of feathers, thread, tinsel, eyes, tubing, heads and tube fly holder, simple step by step instructions for tying Cam Sigler big game tube flies. Previously available only as part of the flys, the Bubble Head Poppers are now available in 3 sizes, from Billfish to Bass. 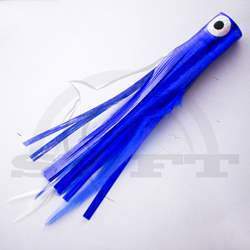 Designed originally for Tube Flies, these heads turn any streamer into a popper and/or a slider by reversing the head and putting the smaller end forward. Made of EVA foam, these heads will squash on the bite to provide better hook-ups. Colors: pink/white, blue/white, blue/yellow, green/white on all sizes. Large also available in pink/purple. Solid color or assorted color packages avail. 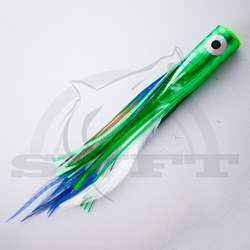 A light weight anodized cone head with bubble holes, sides in front of tube fly or over the hook on standard fly. When stripped it sends bubbles around the fly. Capt Bard Phillips (Decisive) has developed a hook rig (shown above) that promotes the conservation efforts we all employ in the Billfish Sport Fishing Industry. 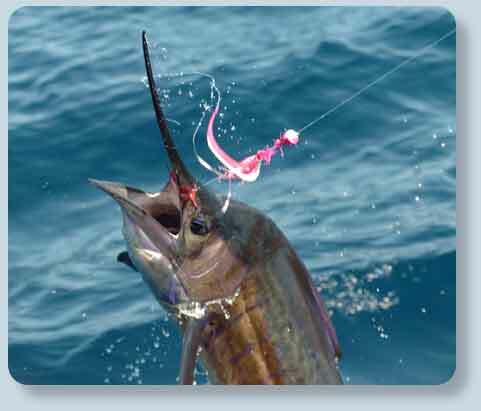 Often with tandem hook rigs fish become hooked in the upper and lower jaw areas during a fight. Unfortunately, there are times when the fish is broken off after hook up and swims away with a hook stuck in both jaws and secured only inches apart by mono. The rig that Phillips has developed allows the fish to freely open his jaws and feed until natural occurrences allow him to rid himself of the hooks. The upper hook is held in place for initial hook up by a rubber band. If the fish ends up lost and also has another hook in his jaw he may easily break the rubber band and this allows the top hook to slide freely on the leader. This rig has been tested thoroughly by a number of anglers and is not found to affect hook up rates on Billfish. We are proud to offer this rig when requested on all of our big game flies, whether rigging IGFA length, or 30” shocks .